Ed Tittel is an increasingly grizzled, if not wizened, veteran of the publishing game, with over a thousand magazine articles and more than 140 books to his credit. 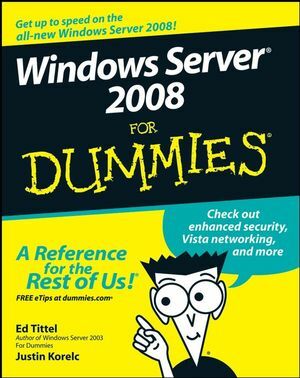 Ed has worked on numerous For Dummies books, including HTML 4 For Dummies, 5th Edition (with Mary Burmeister) and XML For Dummies, 4th Edition (with Lucinda Dykes), as well as books on many other topics. Ed runs a small professional IT practice in Round Rock, TX, that specializes in network-oriented training, writing, and consulting. When Ed’s not busy writing, he likes to spend time with his wife, Dina, and son, Gregory. He also likes to shoot pool, cook, and read sci-fi. You can reach Ed by e-mail at etittel@yahoo.com or through his Web page at www.edtittel.com. Justin Korelc has been working with computers and technology for over 15 years. Justin is an independent consultant working as a writer and trainer. His work focuses on security, Windows and Linux operating systems, and PC hardware. Justin has coauthored several books on media PCs, including Build the Ultimate Home Theater PC (an ExtremeTech BuildIt Guide) and Hacking MythTV (an ExtremeTech title). He has developed online training materials on information security, PC tune-ups, file transfer technologies, and more. Justin’s computer knowledge is self-taught and based on nearly 20 years of hands-on experience. He spends his spare time practicing the fine art of bricolage, playing with computers, and improving his culinary skills. You can reach Justin by e-mail at jusphikor@yahoo.com.